Quarter pallet displays usually have a footprint of either of 600mm x 400mm or 600mm x 500mm, also known as ¼ pallet display units they can be used quite differently to their larger cousins. Shelves can be used to display and offer a variety of separate products or they can be bulk filled with one product and layer cards used to stabilise the display making quarter pallet displays a very versatile 3D POP option. 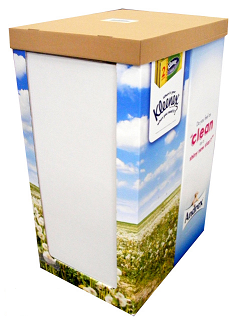 They may have a smaller footprint relative to bulk bin but quarter pallet displays can still sell through in high volumes. Retailers often very effectively co-promote associated products on the same quarter pallet unit, or a have four different products on four different units, making them an effective cross-selling tool. Using good design with stylish, colourful, promotional headers a wide range of products can be promoted in a relatively small retail space. You can have your quarter pallet display units shipped flat packed to make transport and storage easier and cheaper, assembling and stocking them in store or, if it’s a better option for you they can be delivered pre-assembled and pre-filled so that they arrive in store ready to be shopped. You’ll see some of the biggest and most successful brands using quarter pallet displays, bigger isn’t always better. Quarter pallets often subtly compete for customers’ attention with the effective use of design, graphics and colour. To talk through your quarter pallet display needs contact us now.